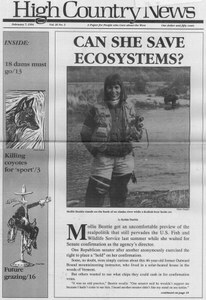 New Fish and Wildlife Service Directory Mollie Beattie wants to restore agency's integrity and purpose. Why care about a snail the size of pinhead? Excerpt from Mollie Beattie speech to Natural Resources Council of America. Chronology from 1885 to 1993. Recycling aluminum cans saves electricity and makes aluminum plants more marginal. Take Back Santa Fe group wants to rein in runaway development. International Erosion Control Association plans conference. Agricultural Outlook Forum set for Denver. Klamath Basin Bald Eagle Conference planned. Poetry contest sponsored by Utah Wilderness Association. Southern Utah Wilderness Alliance to sponsor conference for anti-grazing activists. Review of Making a Change: A Student Guide to Social Change Internships in the Northern Rockies. Board meeting in Boulder, visitors, correction about Comb Wash and Eddie Dutchie. Bruce Babbitt tries to preach consensus to ranchers and environmentalists at star-crossed meeting. Campbell County, Wyo., plans coyote shoot as tourist attraction. Jim Baca faces removal as BLM director. Bruce Babbitt considers expansion of road through national monument. Timber industry finances campaign against Option 9. Save Sierra Blanca fights waste disposal from other states in Texas. Forest Service bans outfitter camps in Idaho's Frank Church-River of No Return Wilderness. Environmentalists and ranchers will have to learn to compromise.